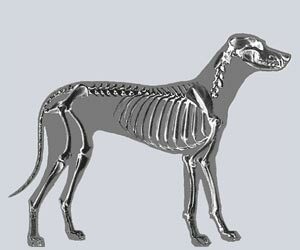 Description of Dog Dysplasia. The definition of Dog Dysplasia is when the hip socket develops abnormally. The hip joint is a ball and socket joint and is where the hind leg attaches to the body. The ball part is the head of the femur and the socket part (known as acetabulum) is on the pelvis. With normal joints the ball rotates freely within the socket and the bones are shaped to perfectly match each other allowing free movement. The two bones are held together by a ligament to make the joint strong. The section where the bones meet each other is called the articular surface. It is very smooth and cushioned with a layer of spongy cartilage. In addition, the joint contains a fluid which that lubricates the articular surfaces. In a dog with normal hips the combination of the joint, ligament and fluid enable the joint to function smoothly and remain stable. Hip dysplasia develops when an abnormal joint structure forms causing the two bones to lose contact with each other. This separation of the two bones within the joint is called a subluxation, and this in turn causes a change in the size and shape of the articular surfaces which results in dysplasia. When you are worried about your pet dogs or puppies it is wise to make general observations and a note of your dog's general well-being before considering a health issue and problem such as Dog Dysplasia. Overall physical condition? Mental attitude? Appetite? Condition of bowels and urinary apparatus? The nose of healthy dogs or puppies is moist and cool but in sick dogs it is usually hot and dry. Hair loss? Dry skin? Discharges? These general observations are useful to consider whilst checking out the symptoms of Dog Dysplasia. Canine Dysplasia treatment - This disease can be treated using a variety of treatment options depending on the severity of the case. Canine Dysplasia treatment - Each individual case of dysplasia will require a different treatment plan dependant on how bad the dysplasia is. Canine Dysplasia treatment - The advice of a veterinary surgeon should be sought immediately if your dog is suffering from any of the symptoms. Methods of treatment include: Medication, Exercise plan, Controlled diet and in some cases Surgery is required. Canine Dysplasia treatment - As a strong genetic link exists with this disease, dogs who suffer from hip dysplasia should not be allowed to breed. Pet Insurance for Dog Dysplasia. Remember canine insurance / pet dogs health insurance for treatment of health and medical problems such as Dog Dysplasia. Unexpected visits to the vet and veterinary treatments for your dogs and puppies due to illnesses such as Dog Dysplasia can quickly add up so get quotes for canine health / pet insurance coverage for treatment due to accidents, treatment of illnesses, prescriptions, surgeries and possible hospitalization treatment for your dogs or puppy. Get the best deals for pet insurance from pet insurance comparison websites - make sure you get the best rates for canine health insurance to cover visits to the Vet for the diagnosis and treatment of unexpected ailments such as Dog Dysplasia. The sole purpose of the Dog Dysplasia section on the Dog Symptoms and Canine Health website is to act as a reference guide to provide useful information to the owners of dogs and puppies. This article on Dog Dysplasia is not intended to be used to diagnose or treat sick dogs or as a substitute for obtaining professional veterinary advice. Please remember that if you are in any doubt about your Dog's Health, or problems associated with Dog Dysplasia, please consult your Canine Veterinary Specialist immediately for professional treatment. Your vet will diagnose whether Dog Dysplasia is the problem and prescribe appropriate medication and treatment.